Header image: Portrait of Richard Alexander Fullerton Penrose, Jr. by George Gibbs, 1934. American Philosophical Society. Whitfield J. 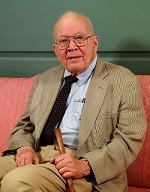 Bell, Jr., Executive Officer of the Society (1977–1983) and Librarian (1966–1980), supported the APS through annuities and a bequest on his death in 2009. Using planned gifts to establish the Whitfield J. Bell, Jr. Fund for Library Acquisitions, he said, "was an easy and a practical way to help assure the continued growth of the Society's extraordinary collections." The APS recognizes donors of planned gifts through the Richard A. F. Penrose, Jr. Association. Dr. Penrose, a Member of the Society for 26 years, bequeathed nearly $4 million to the APS in 1931. Dr. Penrose’s legacy highlights a tradition of generosity that dates to the Society’s earliest days. The APS invites you to explore the options for making such contributions, which can be tailored to your financial priorities. Although many planned gifts are “win-win” situations for donors and charities, each type of gift has its own rules and implications for charitable deductions, estate taxes, etc., which should be thoroughly explored to ensure that they are compatible with your financial and/or estate planning. For a full description of each planned gift, please see below. If you have already included the APS in your estate plans, or if you would like more information on bequests and other planned gifts, such as those that can provide an income stream for the donor and/or a spouse, please contact Linda Jacobs at 215-440-3434 or ljacobs@amphilsoc.org. BEQUESTS have several basic forms. A specific bequest directs that the APS is to receive a specific piece of property, such as a number of shares in a particular stock, a rare book, or a work of art. A general bequest directs that the APS receive a specified dollar amount. A residual bequest designates all or a portion of whatever remains after all debts, taxes, expenses, and all other bequests have been paid. A contingent bequest takes effect only if the primary intention cannot be met—e.g., if there are no surviving beneficiaries. Bequests may be unrestricted or restricted; in the latter case, donors are encouraged to contact the Development Office to assure that the Society will be able to fulfill the donor’s intentions for the use of the funds. In the State of Pennsylvania, bequests may be established irrevocably. A TESTAMENTARY TRUST is a charitable remainder trust (established under the donor’s will) that provides payments to a beneficiary (often a spouse) for life. The principal is paid to the APS upon the death of the beneficiary. CHARITABLE GIFT ANNUITIES are a form of life income gift. In exchange for a transfer of cash or securities, the APS contractually guarantees to make fixed annuity payments to the donor and/or another beneficiary. The payout rate depends on the age and number of beneficiaries. DEFERRED INCOME GIFT ANNUITIES postpone annuity payments until a set time in the future—at retirement, for example. This type of gift is useful for donors who have a high current income, and who wish to augment potential retirement income on a tax-favored basis. CHARITABLE REMAINDER TRUSTS (CRT) provide fixed income (Charitable Remainder Annuity Trust) or variable income (Charitable Remainder Unitrust) to the donor and/or another beneficiary such as a spouse. Upon the death of the last beneficiary, the principal passes to the APS. The donor establishes the trust with cash, securities, or real estate and specifies how the trust income and principal are to be distributed. Most CRT’s are for life, though some are term trusts with a limited period of years, not to exceed 20. Term trusts are sometimes used to provide tuition to grandchildren for private school or college, with the principal then coming to the charity. CHARITABLE LEAD TRUSTS enable the donor to make a charitable gift while retaining the trust assets in his or her family. Income from the trust is paid to the APS for a specified period of years. In a grantor lead trust, the assets are returned to the donor at the end of the trust term. In a nongrantor lead trust, the assets are typically distributed to children or grandchildren at the end of the trust term. The advantage of the nongrantor type is that it can significantly reduce the gift and estate taxes on the value of assets used to fund the trust. Any appreciation in the trust’s assets will avoid gift and estate taxes. REAL ESTATE may be contributed outright, or it may be placed in a trust and sold to provide a stream of life income until the beneficiaries’ death, at which time the principal comes to the APS. Donors may also make a gift of a “remainder interest” in a personal residence or farm. This “retained life estate” plan enables the donor to continue to occupy the residence without disruption. A charitable deduction, often substantial, is given for the present value of the remainder interest. The CHIP—(CHARITABLE IRREVOCABLE PLEDGE) takes advantage of the fact that, in the State of Pennsylvania, donors may irrevocably designate a charity as a beneficiary in their wills. A CHIP—typically a substantial sum—creates an asset on the charity’s balance sheet, against which the charity may borrow (e.g., for a current building or renovation program). The donor avoids being “maxed out” on his or her annual charitable deductions and maintains investment control of the asset and its liquidity. The donor may also pledge to contribute an annual sum to absorb the interest cost of borrowing the principal amount of the pledge. Donors may designate the APS as the beneficiary of a LIFE INSURANCE policy, or make a gift to the Society of a paid-up policy.